Wilford Road is not a very ancient thoroughfare in its present form although all through the middle ages there appears to have been a footway leading across the Meadows from the town to Wilford Ferry, which footway was marked by white posts to guide passengers during flood times. It was a very popular excursion for our forefathers and after they had crossed the ferry at Wilford they regaled themselves at the Coffee House which has come down to our own day as the Ferry Inn, and the Cherry Feasts at Wilford were a very popular form of entertainment. The ferry was one of the old fashioned chain ferries like that which still exists in Mesopotamia at Oxford and unfortunately it was the scene of several disasters. Eventually it was replaced by Wilford Bridge which was built by the Clifton family as an investment and was opened as a public toll bridge in 1870. Although rather out of our ground, it is interesting to note that the first experimental sinkings after coal in this neighbourhood were made just at the foot of Wilford Hill and the spot is marked by a small coppice to-day. The Meadows across which this footway meandered went by the name of the King's Meadows and were associated with the Royal Castle of Nottingham. They have many stories to tell and their most dramatic moment occurred in 1485 when it is probable that Richard III. mustered his force on them previous to his departure to Bosworth, while again in 1487 they were used as a camp and rendezvous for Henry VII's. army just before the battle of East Stoke. The road was formed as far as the Navigation Inn by 1829 and after that was a stile and gates and open track which was improved into a made road in 1853, but even then it was not complete and the bridge over the railway was not constructed until 1863. The Navigation Inn upon Wilford Road has an interesting story to tell for in 1797 the house which stood upon this site was something of a station, for it was then occupied by a certain Mr. Maddock who acted as agent for Mr. Redfern who ran a line of packet boats on the canal for the conveyance of passengers twice a week, between Nottingham and Cromford, which was in those days an important manufacturing centre. The fare was 5/- first class and 3/- second class. A similar boat also ran to Leicester the fare being 5/-first class and 2/6 second class. I have never been able to find any details as to the length of time occupied in the journey or as to the route taken, but in any case it must have been a swifter and more comfortable means of transport than the vile roads of that period. Just about the town end of Wilford Road upon the site now occupied by a great factory were situated the Duke's Wharfs which belonged to the Newcastle Estate and were of considerable importance, while close to them where the factory at the corner of Peveril Drive now stands was the well known Spa Close, so called from the Chalybeate spring which we have already noticed in the opening chapters of this itinerary. Close to this spring was situated the old fishpond of the Castle. Fish, of course, played a very important part in the dietary of the middle ages and our forefathers knew a very great deal indeed about fish culture. Their fishing rods and other tackle were kept in the little rock-hewn house at the foot of the Castle cliff which is so well known a feature nowadays, and the fishpond itself must have provided a considerable amount of food for the garrison of the Castle, for it was of very considerable extent. As we have already seen it was leased to the Water Company who allowed it to become choked with weeds and finally it was filled in in 1792 with soil excavated from the site of the barracks on the upper side of Nottingham Park and the whole area was leased as market gardens. They were exceedingly prolific and their produce was a great boon to the town. It seems to have attracted the attention of garden robbers just as gardens in the Park nowadays seem fair game for everybody, at any rate we have a note that in 1808 a certain Tomlin was flogged in a cart in the Park for robbing these gardens. Brew House Yard c.1900. The Gate Hangs Well pub is on the right; the Old Trip to Jerusalem is on the extreme left. Brew House Yard is a strange little area lying between the Castle Rock and the old bed of the Leen. It is about two acres in extent and originally was part of the Castle precincts. All through the middle ages it was spoken of as "The Rockyard" and it remained extra-parochial right down to our own times and was a jurisdiction by itself possessing something of the rights and privileges of a sanctuary, such as the notorious St. Martins Le Grand and other sanctuaries in London and elsewhere. 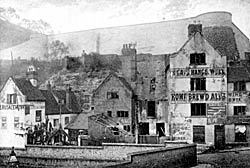 The name of Brew House Yard did not become attached to it until after 1680 and it doubtless arises from the fact that the caves which are situated in it were used for maturing the ale brewed for the use of the Castle garrison in houses situated in the yard which have now completely disappeared. The dovecot of the Castle was situated in this area, probably just above the lower entrance to the water passage which is now shown as Mortimer's Hole and this dovecot would be of very considerable importance to the garrison for upon it would depend to a large extent the supply of fresh meat during the winter months. The Castle Mill, as we have seen was upon the banks of the Leen just within the area. In 1621 the Rockyard was sold by King James I. to two London merchants and I am not at all sure what they did with it, at any rate in Speed's map published in 1610 there is only one house in it, while Thoroton in his map published about 1677 shows a row of thirteen houses which still exist on the north side. As the area was extra-parochial and had its own constable it rapidly became somewhat vicious and was looked upon as a pretty bad district, being the resort of thieves and footpads and other evil characters because the restrictions which were imposed upon the rest of the town did not extend to this little area, with the result that public houses sprang up within it which were not subjected to the somewhat rigorous inspection which obtained elsewhere. At the end of the yard is a gabled house about half way up the Castle Rock which was anciently called "Gibraltar" and was built about 1687 by John Collin, the grandson of Lawrence Collin the founder of the Collin family whose home we saw off Castle Gate. This house in due course became a public house and was well known as a recruiting centre and associated with it are stories of mutinies and other disorders, whose interest has now almost completely passed away. Curiously enough it is completely isolated from Brew House Yard nowadays and is entered from Castle Boulevard. The row of red brick houses which we have seen were first shown in Thoroton's map published in 1677 have been very much knocked about and restored, but in spite of their drastic reparations they are still a very charming spectacle. They appear to have been built by the first Duke of Newcastle about the same time that he erected the present Castle Buildings and they were probably used as dwelling places for some of the servants of the household in the Castle. 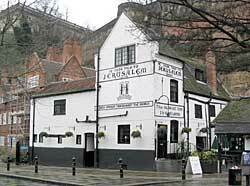 The Old Trip to Jerusalem pub overshadowed by Nottingham Castle (A Nicholson, 2004). But undoubtedly the most interesting building in the yard is the "Trip to Jerusalem" the date on the sign is 1190 and this no doubt refers to the original foundation of some older house which has now disappeared for the present house is merely a front to the very interesting rock chambers in the rear. Its name is extremely difficult to account for and appears to be quite modern. The earliest reference that I have been able to trace is in 1760 when it appears to have been referred to as "The Pilgrim." Thoroton speaks of Brew House Yard as a "receptacle for fanatics" and amongst these fanatics was a sect calling themselves the "Philadelphians" or "Family of Love" and referring to each other as "pilgrims." It is possible that this body may have met in this house and so got its name of "The Pilgrim" which name was gradually colloquialised to "The Trip to Jerusalem." But whatever was the origin of the name there is no doubt about it that the cellars and the Brewhouse cut out of the solid rock, and the upstairs room with its shaft driven through the rock up to the level of the Castle platform are extremely interesting features. Anciently there was a curious court held at Cotgrave under the Prior of St. John of Jerusalem and styled "The Master of St. John's Court of Shelford." It had jurisdiction over a large number of widely scattered places including "The extra parochial liberty of Brew House Yard" it would be interesting to trace the association of the Prior of St. John of Jerusalem, with this ancient "Pilgrim Inn." Refresh and pay and travel on." painted upon it, but this inn has now completely disappeared and it does not seem to have any interesting history.